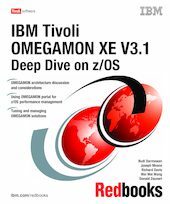 This IBM Redbooks publication describes the IBM Tivoli OMEGAMON XE product family, Version 3.1.0, that runs on z/OS. We start by providing the product history over time and the terminology convention that we will use in the book, which should be noted carefully because the products are in transition from Candle terminology to the new terminology related to IBM Tivoli Monitoring Version 6.1. We conform to IBM Tivoli Monitoring V6.1 terminology as much as possible, although for some direct references to screen shots, we use the terminology that is shown in the figure. The product is installed using the IBM Configuration Tool. This is explained for new users who want to install IBM Tivoli OMEGAMON XE, because the process is somewhat different from standard IBM products that are installed on z/OS. The concept of runtime environment is explained here as well. On the operation side of IBM Tivoli OMEGAMON XE, we discuss problem determination and tracing concepts and facilities that are available for IBM Tivoli OMEGAMON XE, as well as performance considerations. As IBM Tivoli OMEGAMON XE is meant to monitor performance of the system, its overhead should not affect overall system performance. Last but not least, we offer sample usage scenarios of performance management using IBM Tivoli OMEGAMON XE products.